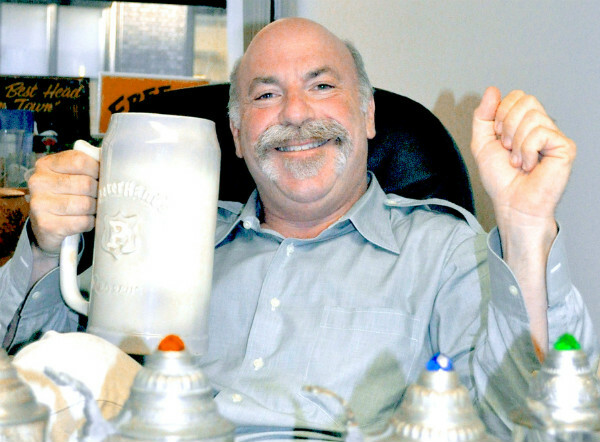 Jon Bloostein lifts a stein to good beer. After attending eight undergraduate schools and earning an MBA, Bloostein was involved in assorted commercial efforts and had an investment banking career before deciding to promote craft beer, a product he had learned to love during trips to the Bay Area. When he opened his first Heartland Brewery in Union Square, in 1995, it was the largest brewpub in the tri-state region. “I had no restaurant experience whatsoever, but they [my investors] knew I would never be able to sleep if the place started to fail,” he says. 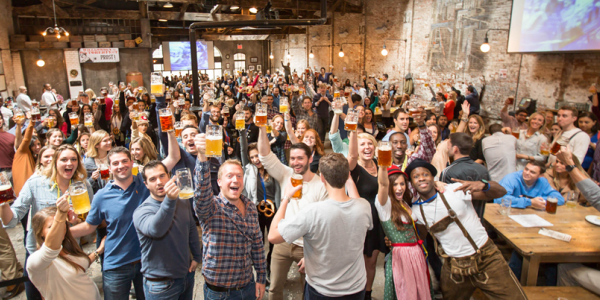 Today, with a staff of 620, the 100% employee-owned Heartland Brewery Group which Bloostein created includes nine venues. Visitors to New York flock to these prime locations and make up a large percentage of the Heartland Brewery clientele. You’ll see travelers from around the world mixed in with the locals at the two-story, 450-seat Heartland Brewery and Rotisserie inside the Empire State Building, and in the Times Square neighborhood at Heartland Brewery Midtown West, Heartland Brewery in Times Square, and HB Burger. Bloostein suggests that tourists comprise 90% of the crowd at the Empire State and 75% of the customers at Guy’s American Kitchen & Bar, a Theater District partnership with Food Network star Guy Fieri. Houston Hall. Are you even allowed to have this much room in New York City? Bloostein also developed three neighborhood beer halls (Flatiron Hall, Houston Hall, and Bernheim and Schwartz), which draw locals with entirely different designs, menus, and beers than the Heartland Breweries. “If you want to feel the New York vibe and be transported to another place and time, these are the places to be,” Bloostein says. The beer rates as some of the best craft beer around, with several medals from the Great American Beer Festival to prove it. Each venue serves more than 25 varieties of beer annually, including 12 on tap at any given time. All are made near Albany in upstate New York, where the Director of Beer oversees the production to exacting Heartland specifications and flavor profiles. Heartland’s burger is seriously good. Some varieties cry Americana, as in Farmer Jon’s Oatmeal Stout, Indiana Pale Ale, Red Rooster Ale, and Corn Husker Lager. French Toast and Belgian Golden Ale tempt with a European panache. “Voyages of Beer” give customers an opportunity to taste six types. The flight of five-ounce pours are served on a round tray labeled “Real Beer,” which has numbered round spaces for the glasses, each of which arrives with its own description. The range starts with a light beer, at about 3.9% alcohol, and moves upward to a hoppier blend at about 11%. Training is key to the success of serving beer. A Beer Sommelier shows bartenders how to educate guests to choose for their individual taste, but before bartenders can serve or speak with guests they must earn 100% on both written and verbal Beer 101 tests. “Over time, they get more advanced training with Beer 201 and 301 classes,” Bloostein explains. Dark or light, two dipping sauces. Decisions, decisions. “Serving great craft beer has always been the mainstay of the restaurant group, while creating beer-friendly food elevates the experience,” Bloostein adds. He’s certainly set the menu apart from the competition. 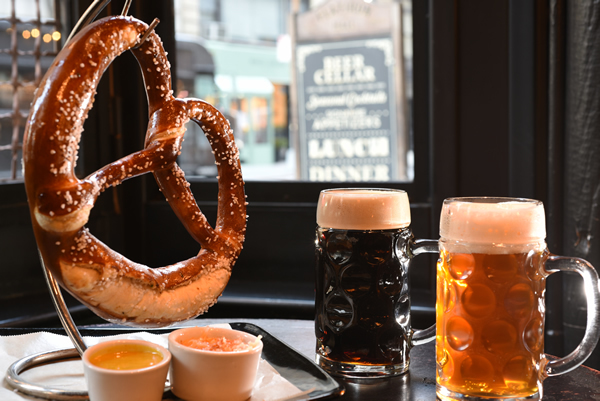 Serving a giant pretzel is more than a gimmick, it’s fun and people find it special (so do the several New York bars which have copied the idea). 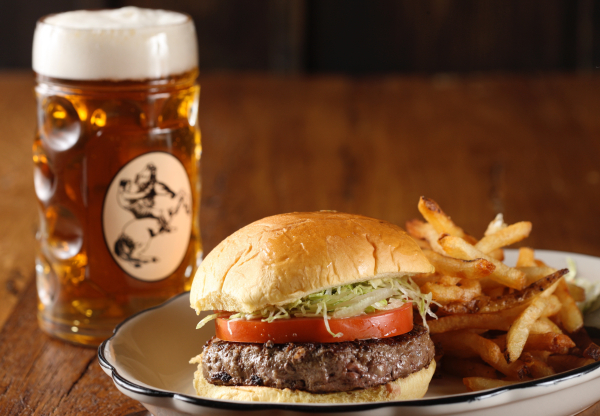 Heartland Brewery was the first brew pub in New York to offer sliders, a bigger and better black Angus version of the “tiny and tasty” White Castle burgers Bloostein ate as a kid. Take advantage of happy hour menus to sample one for just $2, with a $6 drink to go with it. Yes, this is vegetarian. Really. Innovative, beer-friendly menu options also include Buffalo chicken and pastrami Reuben spring rolls, available at all the beer halls. To further please customers, there are kids’ choices, gluten-free options, and a classic New York cheesecake. Great atmosphere at the Empire State Building. 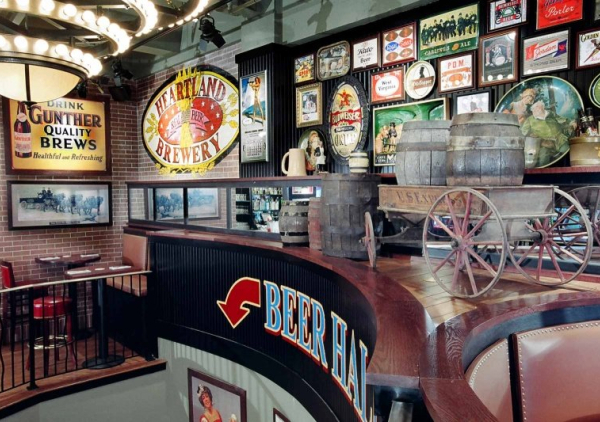 Bloostein infuses a sense of brewing history into each restaurant’s design by showcasing an array of authentic beer memorabilia. He has amassed a vast collection of breweriana from all over the world, with some beer collectibles that date to the early 20th century. Along with vintage posters, photographs, signs, and trays, there are old Rheingold (a New York product that used to dominate the local beer scene) bottles, and, of course, a myriad number of steins. Those items that don’t decorate the restaurants and brew halls are stored in a warehouse on Bloostein’s 90-acre upstate farm. That farm is also home to a 1,000-square-foot organic garden, where Bloostein grows eight varieties of heirloom tomatoes, sweet Walla Walla onions, and cucumbers, some of which he pickles. 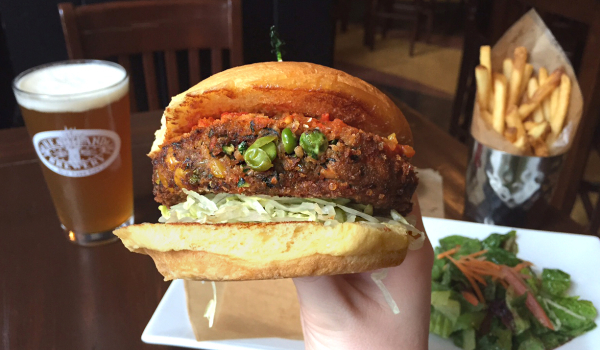 In season, home-grown produce appears on the Heartland Brewery Chop House menu. A space at the bar at the very inviting Heartland Brewery Times Square. Given how scarce space can be in NYC, it’s unusual to find as much square footage as Heartland holds down around the city. 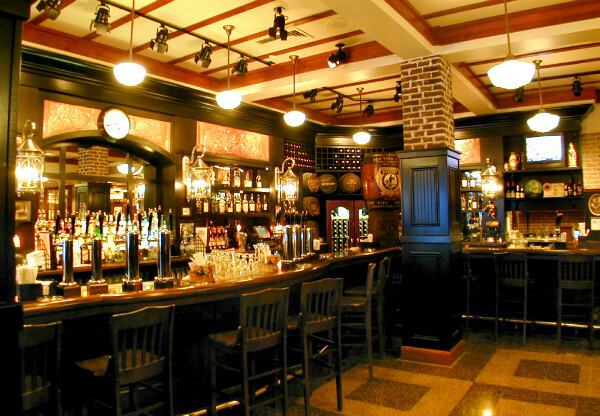 Weddings and events are often booked in the company’s various back rooms and bars. As a good neighbor, the Heartland Brewery Group offers space at no charge to reputable charities and organizations whenever they are unoccupied. And when a charity books a fund-raising party, the company makes a donation to that charity of 10% of the party price. Still ever eager to originate new ideas, Bloostein circles back to the spirit of innovation that’s driven him his entire life. “We are always looking for the next best items to find or create to match up with our beers,” he says.